Home / house / Decorating Bardstown! Monday Stuart and Jeremy visited Heaven Hill Distillery to decorate their Bourbon Heritage Center for Christmas. We had such a great time! Every other year that we’ve done this (approx 6 years I think), there has been a total overall theme to the decor. This year, they wanted to have different areas of the building be decorated in different looks! This wreath is one of two very large wreaths on different sides of the building! To get an idea of how big..they are as tall as Jeremy when standing on the ground! That large bow you see (not including the ribbon that goes around the wreath) took 10 yards of each ribbon! 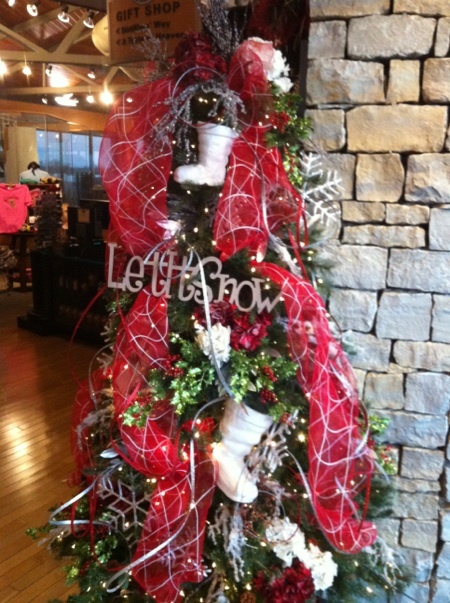 This tree greets the visitors when they enter the gift shop! They wanted fun and happy, with Red, White, and Silver! I think we succeeded! I simply love the white boots! They are adorable! It’s hard to see all of the detail in the tree, but those red and white poofs are actually iced white and red hydrangeas! There is so much in this tree that you can’t see in the picture! These last two photos are of the other large wreath on the other side of the building! 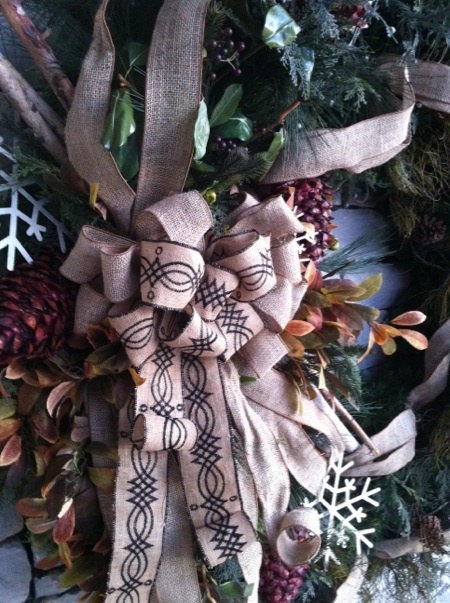 I love the use of the burlap in these wreaths! 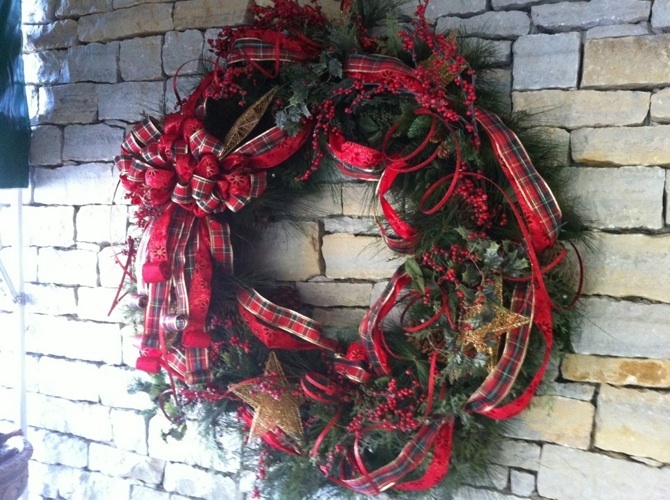 Who says burlap and birch doesn’t scream Christmas! Notice in the close up, that we layered the two burlap ribbons to really show off the embroidered burlap! To do this, we started with the regular burlap and made several loops like we would for a normal bow. Then with the other ribbon, we made a smaller bow (with smaller loops than the regular ribbon), and then attached it to the center of the bow with chenilles (pipe cleaners). Here’s a small tip….you might have noticed the ribbon tails rolled up! To keep their shape, we used a stapler to staple the curls in so that the wind wouldn’t blow them out! Only you and we know!